Knighton Heath Golf Club is a genuine heath land course situated on 90 acres of high ground beside Canford Heath and is a great place to play golf in Dorset. It is well known for its friendly welcome to both visitors and members and comments are received almost weekly regarding the bar and catering facilities at the club. The course is expertly managed by Roger Myatt and his team and is always in superb condition, with arguably some of the best greens in Dorset. Visitors and societies are all welcome and members have reserved tee times. 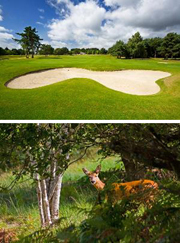 Ours is a challenging course in a fine location with varying types of wildlife on the course. Why not give us a try? We welcome families and junior memberships and we are proud to say we are now Golfmark accredited with High Achiever status. Our social calendar is always full and it is a great club to be a member of.